What are your skincare must haves when you travel? For me, my skin tend to get more sensitive, red, and more likely to break out when I travel. So I always bring products that can calm my skin, reduce redness, and relieve a breakout fast. 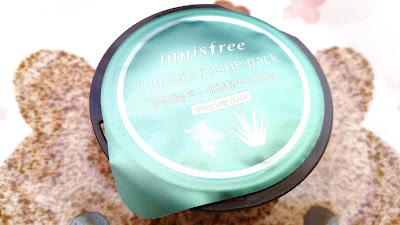 One of the products in my travel emergency skincare kit is this Innisfree Capsule Recipe Sleeping Pack in Aloe & Bija. This was just added to my emergency kit this year and has done an amazing job in healing my skin every time I travel. I first got this in a large Innisfree order I made and have since reordered it so many times that I've lost count. What made it a staple in my emergency skincare kit is that it can do just about all that I need to heal my skin and then some. When I first got the Capsule Recipe Packs, I thought they are so convenient and would be great for traveling. Minus the resealing issue, which I have mentioned multiple times in my past capsule recipe pack reviews, these are seriously great for travels. One pack can last multiple uses as well, making it even more worth it. For me, one pack can last me a little less than one week, so I pack accordingly when I travel. That way, I don't have to worry about any unfinished Capsule Recipe Packs. Innisfree's Capsule Recipe Packs comes in 2 lines. The wash-offs and the sleeping packs. This Aloe & Bija is part of their Sleeping Pack line. I have reviewed a couple of Recipe Packs from each line and I will be reviewing more in the future. 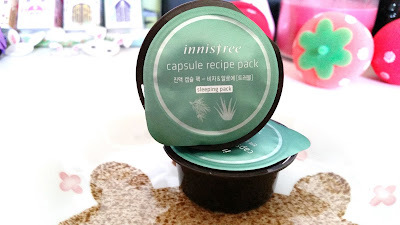 However, for now, let's get to know this Innisfree Capsule Recipe Sleeping Pack in Aloe & Bija. Product Description: A sleeping pack formulated with bija and aloe to help relief the skin. It's easy to absorb and will add hydration to the skin. The sleeping pack is very refreshing and can help to soothe irritated skin. It can also help to calm down stressed skin, reduce redness, and relieve a breakout. To Use: Use this as the last step in a skincare routine. 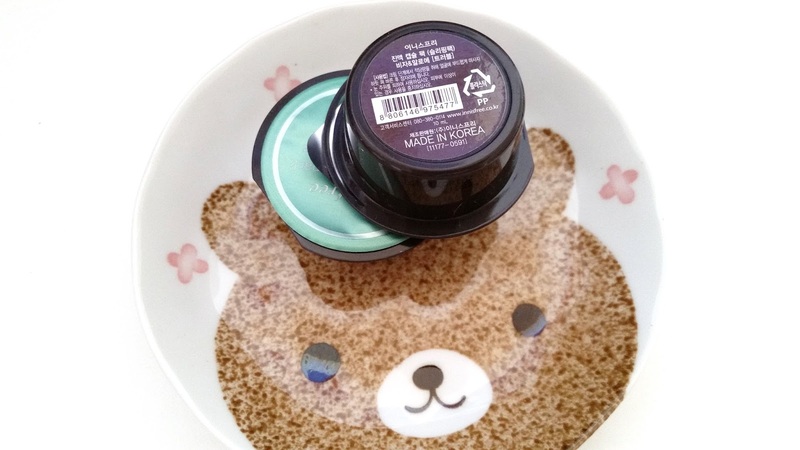 Apply a desired amount onto the skin and go to sleep. Rinse off in the morning and follow up with your morning skincare routine. Ingredients: WATER, ALOE BARBADENSIS LEAF EXTRACT, HIBISCUS ESCULENTUS FRUIT EXTRACT, PORTULACA OLERACEA EXTRACT, PUERARIA THUNBERGIANA ROOT EXTRACT, GLYCYRRHIZA GLABRA (LICORICE) ROOT EXTRACT, PAEONIA LACTIFLORA ROOT EXTRACT, CNIDIUM OFFICINALE ROOT EXTRACT, CITRUS UNSHIU PEEL EXTRACT, ORCHID EXTRACT, CAMELLIA SINENSIS LEAF EXTRACT, GLYCERIN, CAMELLIA JAPONICA LEAF EXTRACT, OPUNTIA COCCINELLIFERA FRUIT EXTRACT, PEG-40 HYDROGENATED CASTOR OIL, SOLUBLE COLLAGEN, SODIUM HYALURONATE, 1,2-HEXANEDIOL, ACRYLATES/C10-30 ALKYL ACRYLATE CROSSPOLYMER, TRIETHANOLAMINE, C12-14 PARETH-12,ETHYLHEXYLGLYCERIN, ALOE BARBADENSIS LEAF JUICE, TRISODIUM EDTA, ALLANTOIN, TORREYA NUCIFERA SEED OIL,XANTHAN GUM, FRAGRANCE, PHENOXYETHANOL, YELLOW 5 (CI 19140), BLUE 1 (CI 42090), BUTYLENE GLYCOL, PENTYLENE GLYCOL, ULMUS DAVIDIANA ROOT EXTRACT, AMARANTHUS CAUDATUS SEED EXTRACT, ARCTIUM LAPPA ROOT EXTRACT, LINUM USITATISSIMUM (LINSEED) SEED EXTRACT. Packaging: Like all Capsule Recipe Packs from Innisfree, these comes in a small brown-black container. The only variation is the lid which features the color of the specific product type, pictures of the main ingredients, and their names. The back of the package have some information about the product, however, it is mostly in Korean. The package does come with a build-in slit which is where the flap is inserted to help 'reseal' the product. However, from my experiences, it doesn't work that well majority of the time, so it's best to use something else to keep the flap down. Texture: The Aloe & Bija Capsule Recipe Sleeping Pack looks gel like and feels gel like at first. However, once applied it turns more liquidy. Making it easier for the skin to absorb. Note: once opened, it's best to finish the Capsule Recipe Packs as soon as possible because they will start to dry a bit over time. Color: This Aloe & Bija one looks clear and colorless. However, according to the ingredient list, blue and yellow were added. So, there might be just a tad bit of blue green in the mix, but not really noticeable at all. Scent: It's got a herbal scent that's fresh and nice. The scent is not overly strong, however, it isn't super light either. Personally, I don't mind it. My Thoughts: I think it's pretty clear that I like this Capsule Recipe Pack in Aloe & Bija. It was unexpected really, because at first I didn't think I would like it. 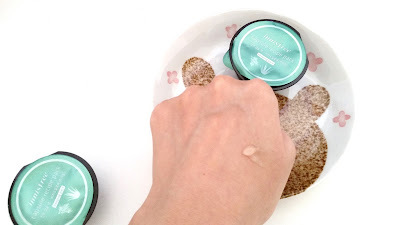 I've tried other Bija products from Innisfree's line and the ones that I've tried didn't work for me at all. So, I thought this one might not work for me either. However, I was glad I gave it a try because it's been great for my skin. Like all new products, when I first tried it I patched test like no other. 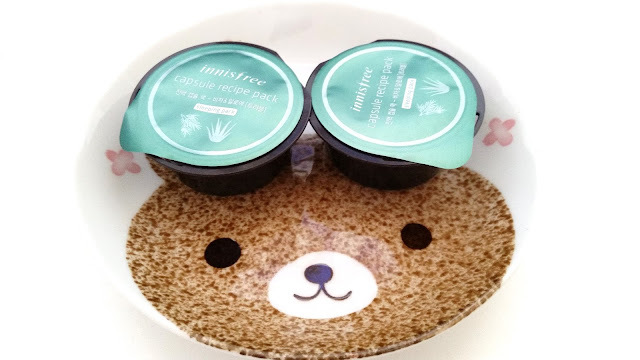 I was careful because I know I've tried other bija products from Innisfree that didn't work for me. So if this was to cause issues, careful patch tests might help me determine the issues before it causes a full face war. I was surprised to find no issues or irritations like the other bija products. I hesitated at first because I thought it was a fluke. However, turns out it wasn't and after months of using, I added it to my emergency skincare set. My first emergency skincare use of this product was in the summer when I traveled to another country. The differences in climate, environment, water, and other factors had my skin going a bit crazy and broke me out the day after I arrived. The minor food allergy also didn't help either. So I broke out my emergency kit and started fixing. 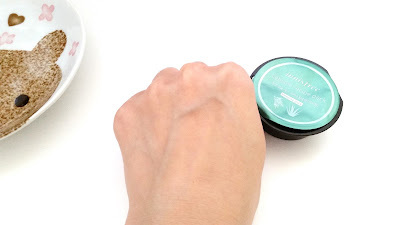 The Aloe & Bija sleeping pack was able to calm my irritated skin and reduce redness. It helped with my breakouts too. In just 2 days, my face no longer looked like an angry tomato (okay, maybe it wasn't that red but you know what I mean). It took longer for the acne to go bye bye but at least the redness and irritation was visibly reduced. By the time I boarded the plane for our second destination, my skin was a lot better with just a 1 or 2 small pimples left. That experience and ones after earned the Aloe & Bija sleeping pack a permanent spot in my emergency skincare kit. What I like about the aloe & bija sleeping pack is how refreshing and soothing it feels on my skin when I apply it. The feeling lingers for quite a while too, which is nice. Most of its noticeable effects comes the next morning, such as reducing redness, relieving breakouts, etc. The sleeping pack always feels really moisturizing on my skin as well. Sometimes if I feel like I need an extra moisture kick, I'll apply 2 thin layers of the sleeping pack and it works great to hydrate my combo to oily skin. My best acne reducing combo is this and an acne patch (or sometimes at home I use pink powder) on top of the acne. It does wonders overnight and my acne is always visibly reduced in the morning. It doesn't go away completely but it always looks better than the night before. The only down side for me is its lack of resealing. 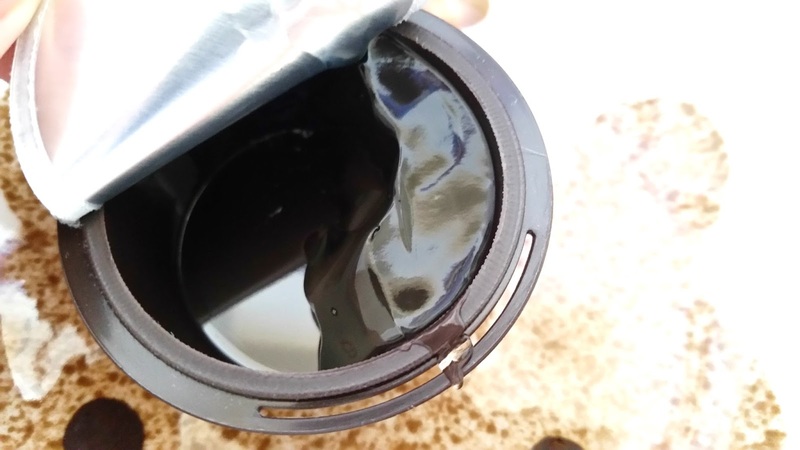 While the Capsule Recipe Pack's build-in slit is supposed to help reseal the product, it just doesn't really work that well at all. I always end up using a small eyeshadow palette on top or a lid from another product to help keep the flap down. 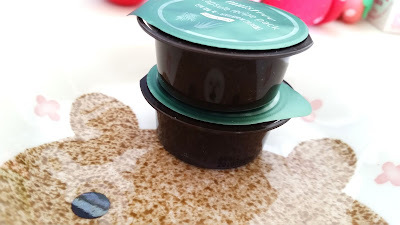 I do wish Innisfree can create a better reseal design. Final Thoughts: I really, really love this Innisfree Capsule Recipe Sleeping Pack in Aloe & Bija. It has become a staple in my emergency skincare kit and I use it often at home as well. I love how soothing it always feels when it's applied and how well it works to help reduce redness and skin irritations for my skin. Its acne relieving effects are great as well and it adds a good amount of moisture to the skin too. Would I repurchase this in the future? Duh. I have repurchased this so many times that I don't even know anymore. 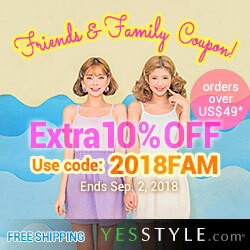 I usually do my repurchases when Innisfree has a special promotion going on. Kind of like now for the month of Decemeber. It's much more worth it because the promo is usually buy 3 get 3 or buy 5 get 5 so, you are essentially getting the capsule recipes packs for half off. Do I think this product is worth a try? Yup! If you are looking for a product that can help to reduce redness, or soothe the skin, or relieve acne, or refresh and moisturize the skin, then this is worth a try. This sounds perfect for my uber oily skin. I'll have to try it!